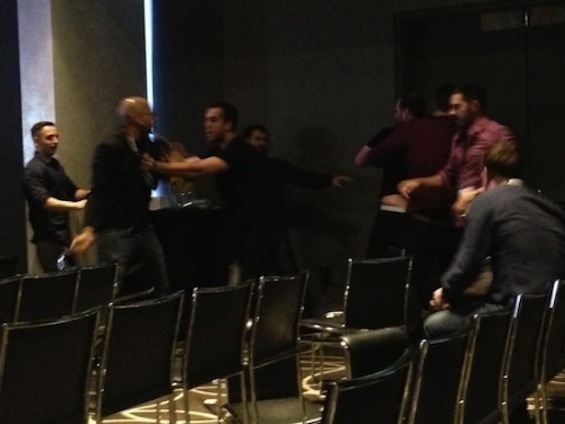 Well, this isn’t your everyday story from a music industry conference, but it seems that a dispute over Facebook-fan numbers during a panel discussion, spurred by Diplo in the direction of DJ BL3ND, led to managerial fisticuffs yesterday at the International Music Summit’s Engage conference in LA, at which Beatport’s own Matthew Adell also spoke. According to Live for Live Music, Diplo was heading up a panel and talking about how his Facebook-fan numbers didn’t reflect his real industry clout, particularly in comparison to, in his opinion, the lesser-known DJ BL3ND, who has nearly 10 times as many fans. After accusations were thrown around, a physical fight between Diplo’s and BL3ND’s managers broke out. “BL3ND’s manager, Haddad, was less than thrilled with the comments, especially when Diplo said that BL3ND’s statistics are questionable considering “he has only played a string of shows in the OC.” Haddad argued during the panel that BL3ND had sold out shows in New York and other areas, when Diplo’s manager, Kevin Kusatsu told Haddad to “Shut Up!” Diplo then commented, “I only have three hundred something thousand facebook likes, but I’m pretty sure I’m bigger than DJ BL3ND”. While Diplo did his best to backtrack and make amends for the comments, saying that he is actually a fan of BL3ND’s, it apparently was not enough to stop Kusatsu and Haddad from going after each other, after initially attempting to talk it out civilly. The fight was eventually broken up by IMS officials, but has been the talk of the town since it occurred. Read the entire original post, along with comments from folks like Deadmau5, here.